This year's Essen was a good one for abstract titles. Here are a couple of new games that I was looking forward or picked up for the show and have had a chance to write some reviews of along the way. Simple abstracts make a refreshing change from the rules-heavy and complex Euro and thematic games filling most of the halls, so it's great that many publishers are bringing out new ones every year. This is the new game from Chislaine van den Bulk at Giuoco. Last year, the company brought the family pick-up and deliver game Koplopers and Dwarsliggers to the show, but this year we were treated to a nice simple abstract, although with pretty glass pieces. Lino begins as a normal member of the n-in-a-row games and adds some scoring twists to add tension and more difficult choices all through the game. I'd probably describe this game as a cross between the classic connection game of Hex (with a twist of Twixt) and the fun of playing with the chunky wooden blocks that are even bigger and chunkier than the ones that come with its cousin game Rumis. The challenge of the game is negotiating the slightly fiddly connection rules and balancing your own dashes for a connection either way across the board with remembering to take time out to block your opponent's attempts. A new game from Steffen Spiele, this is a very simple tile-laying game about forming the largest connected area of your own chocolate with a couple of interesting selections. A little like Taiji, since every piece you lay can help your opponent, and with a heavy dose of timing, to see who can make the best use of the super-powered smartie chocolates that can form a second layer over the top. From Huch & Friends, a little reminiscent of Ingenious with a timing components. Players lay 3-hex tiles to create (and later destroy) regions in three different colours. During they game, they can forgo a tile lay to instead play one of their hand of scoring cards which yield points only if one region is larger than another. The game has both a construction and a deconstruction phase. A newcomer, Hopwood games partnered with Prime games (née JKML) to bring this very cute abstract game to the show. 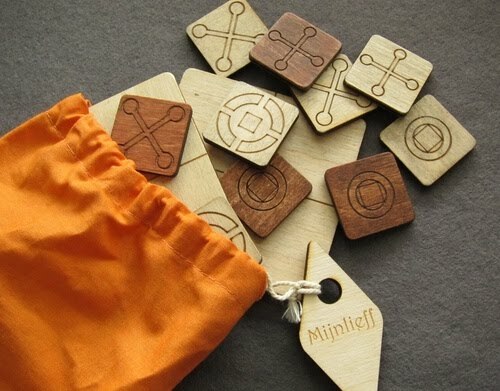 Mijnlieff is a combination of tic-tac-toe headed family of n-in-a-row placement games that becomes a fascinating little game with the addition of player-driven placement restrictions and a variable board setup. It's also nice to see new approaches to wooden components, here the game is made from slightly weathered board that has been laser cut and etched. The new Jactalea game heads in a very new direction to their previous titles! 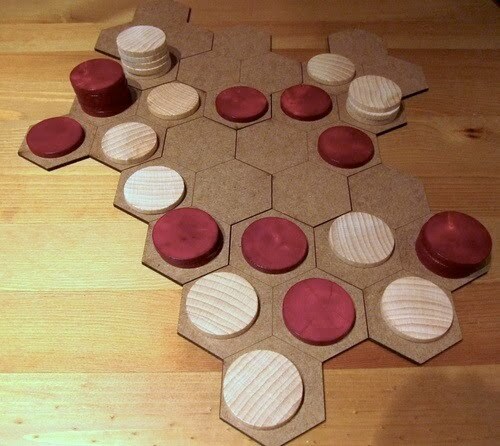 Splits is a wooden game, played on a variable board of 4-hex plates, the players take it in turns to divide one of their stacks of wooden discs and move one part as far as they can in a straight line. As the game goes on, the stacks slowly shrink and the board fills up. Who will have planned ahead well enough and control enough territory to keep playing?